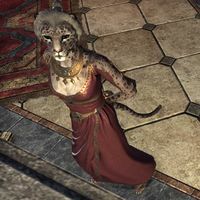 Baimarri is a Khajiit noble who can be found at the palace in Sentinel, observing the entrance from the upper level. She has no unique dialogue. This page was last modified on 25 June 2018, at 14:50.